Pain is a noxious sensation arising from any part of the body. It is often described in physical terms or as an emotional reaction to the painful stimulus. It can be stabbing, burning, tearing, nauseating or sickening. Many diseases of the body or sudden injury can cause pain. Since pain is universally understood as a sign of disease, it is the most common symptom that brings a patient to a physician’s clinic or starts the desire to search for relief offered by painkillers. The function of the pain sensory system is to protect the body and maintain function. Pain has been classified into two major types: fast pain and slow pain. Fast pain takes shorter to appear after the pain stimulus, which is about 0.1 second. The slow pain takes slightly longer to appear after the inciting cause. It begins after 1 second or longer and then persists at that severity. Fast pain is felt as sharp, pricking or electric pain. This type of pain is felt due to a thorn prick, cut from a blade or skin burns. Slow pain is described as burning, aching, throbbing or a dull ache. This type of pain is usually associated with tissue destruction. It can occur both in the skin and in deep organs. The pain receptors in the skin and other tissues are free nerve endings. These pain receptors can be stimulated by mechanical, thermal and chemical pain stimuli. In general, fast pain is elicited by the mechanical and thermal types of stimuli, whereas slow pain can be elicited by all three types. One chemical that seems to be most painful is bradykinin. Many researchers have suggested that bradykinin might be the agent most responsible for causing pain after tissue damage. 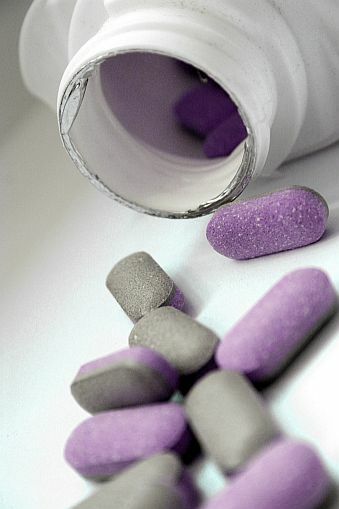 Painkillers or analgesics are the drugs used to get pain relief. The pain sensation is carried by the nerves (peripheral nervous system) through the spinal cord to the brain (central nervous system, CNS). Based on the type of action, they can be broadly classified into 2 major groups – non-narcotic analgesics and narcotic analgesics painkillers. Their effectiveness varies. NSAIDS (Non-steroidal anti-inflammatory drugs): The principal therapeutic effects of NSAIDs derive from their ability to inhibit prostaglandin production. The first enzyme in the prostaglandin synthetic pathway is prostaglandin G/H synthase, also known as cyclooxygenase or COX. This enzyme converts arachidonic acid to the unstable intermediates PGG2 and PGH2 and leads to the production of thromboxane A2 and a variety of prostaglandins. Therapeutic doses of aspirin and other NSAIDs reduce prostaglandin biosynthesis in humans. Aspirin and NSAIDs inhibit the COX enzymes and prostaglandin production. NSAIDs are mild analgesics. However, consideration of the type of pain, as well as its intensity, is important in the assessment of analgesic efficacy. NSAIDs are particularly effective when inflammation has caused sensitization of pain receptors to normally painless mechanical or chemical stimuli. Pain that accompanies inflammation and tissue injury probably results from local stimulation of pain fibres and enhanced pain sensitivity. These painkillers include aspirin, Indomethacin, Mefenamic acid, Ibuprofen, Piroxicam, Diclofenac, Ketorolac and Roxicob. Aspirin irreversibly blocks the enzyme cyclo-oxygenase whereas other NSAIDs have reversible blocking action resulting in longer duration of action than aspirin. Paracetamol is a weak cyclo-oxygenase inhibitor in peripheral tissues. Narcotic analgesics are the analgesics that have central nervous system effects. They bind with the opioid receptors in the CNS to block the perception of pain or affect the emotional response to pain and are much more effective. They are of two types. Natural – Narcotic analgesics containing alkaloids of opium eg. Morphine and Codeine. Type of used painkiller should depend on the type of pain. If you feel that you need more effective painkiller than those available in the pharmacy without a prescription, you should contact and consult with your physician. He should recommend you the appropriate type and dosage suitable for you. ← Symptoms of the swine flu – how to diagnose it?